I'm just about to get started with a restoration project on my 260z that I've owned for 6 months or so. During the last few months I've generally fettled up a few bits and pieces, sorted the brakes, serviced the carbs, fitted one of Sean Dezart's exhausts etc. I was going to run it for a while but the floors and other areas need work and to be honest I'm itching to get started and have quite a few ideas, I really enjoy having a project on the go. I expect from looking at other rebuilds that I'm opening a large can of worms and I do anticipate having to replace a few panels and expend a couple of rolls of Mig wire along the way. I'll try and post an update each week and add a few pics. That's a tidy looking motor T&B. Doesn't really look like a project in those pics! But if you reckon the floors are in need of work, then right you are. Has it had much bodywork before, what's the history of it? I'm not sure if it was always parked in one place but the corrosion runs down the passenger side, the drivers side is way better. ....... fitted one of Sean Dezart's exhausts etc. Any photos of that pretty please ? Like your garage, you have plenty of room to set about your restoration. Look forward to reading your thread. BTW: You tend to find that the near side is where all the puddles are on the road, so that side of the car gets wetter more often over the years. That may go some way to explaining it? Thanks Ped, its a great garage, I'd spend more time in there if I could. I built it before my last project a Series 1 1949 Land Rover, unfortunately this takes up a load of room in there and along with loads of bikes means I have to shuffle kit round to even move. I think its a man thing we tend hoard to a higher degree than we actually have space for. I've junk jammed all over Cumbria! Sean, I promise next time I get in their I'll get those pics you want, I've been busy all weekend. Andy, give me a shout if you need a hand with anything be good to see you get going with it. Cheers Paul, all help appreciated!! Not much exciting progress to report this week, I only managed a couple of afternoons stripping stuff off. For no reason other than it seemed a good place to start I've started to strip the car from the front backwards. The bonnet is off along with all lighting, front bumpers, grille, radiator etc. I've stripped the loom back as I've progressed labelling and photographing stuff as it comes off. Most of the pics are pretty boring right now, but they'll serve as a reference one day. I've included a couple of pics of the manky passenger air duct and strangely better driver side. I managed to slide through the snowdrifts and drop in at MZR in Bradford to have a look at their Orange 240z as I was passing, totally awesome. Some of their ideas really get you thinking. They have a new take on power steering which sounds clever. Sold isn't it now, their orange one? The 100s of pics taken when disassembling are dull but you know they'll come in handy one day! Looks awesome, iv just started my restoration as well. You say the floor rails are holed, i believe this is the same problem i have from the car being jacked up lots in the past. i would really appreciate it if you could show me a picture of the state of yours? an what do you think you will do to go about it? Jordan, I think its really just a corrosion issue on mine, they've rotted out at the front where they would collect most road water, the floor pan has gone into holes around them too. I've attached the only pic I have at present of that area. Another slow progress week, been away MTBing in the Peak district all weekend and then my Series 1 Land Rover made a cry for attention and ate the water pump so I've had to strip that out which meant I had to take the front end out. I've got the block n tackle holding the engine on the Z just ready to lift out and I dying to get on it, but if I don't do the Landy first I'm short on garage space and its not the time of year to be outside up here. The engine bay and dashboard area is now stripped back, engine, gearbox, crossmember and front end off, wiring and all ancillaries removed. As I've stripped back the corrosion has started to reveal itself, mainly on the inner wings and bulkhead which I was aware of but had been poorly repaired in years gone by. I've attached a few pictures of the corrosion. One of the areas that concerns me most is the scuttle / bulkhead junction where years of rainwater have found there way through from the scuttle area into both the engine bay and footwells. Has anyone else had this issue and effected a repair that they have pictures of? Hmm! I hadn't thought of splitting it open like that. I was trying to figure out how to patch and weld in impossible locations! Thanks for the idea. Thanks for that! Yeah i think I'm just going to just the two sections where mine have been jacked up on an weld some new bits in. Looks really good, best of luck with it! at the end of it all we should both have very solid cars haha. Mostly I've been waiting for a slot at the blast shop to get the car stripped properly, its due in next week. 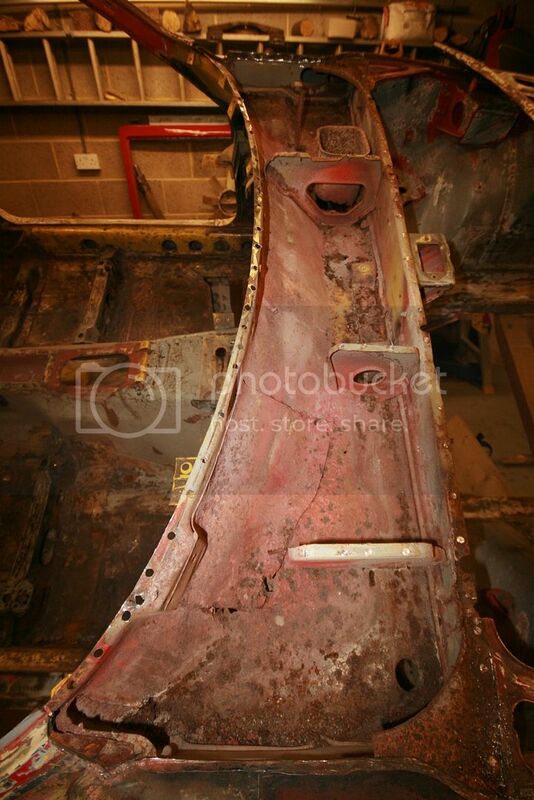 The car is now down to a bare shell with everything that can be removed removed!. The bulkhead is the worst area so far but I reckon repairable, I'll post pics of the repairs once I get going with these. The rear wings are solid with filler, it will be interesting / frustrating to reveal this damage. 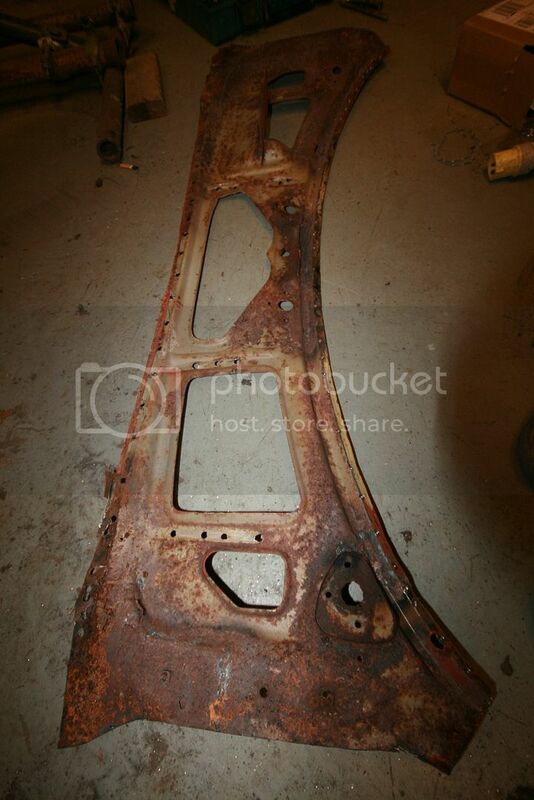 In the meantime I've cut away a few rust areas and done a few smaller repairs, no point doing anything major until all the corrosion is revealed. I've attached a few pics below of the car as it sits now and and a couple of early repairs on the bulkhead and a headlight bowl.